Creating a page to submit a new poem. Modifying the poems page so that it shows all the current user's poems, even those not yet approved. Creating a page to edit an existing poem. 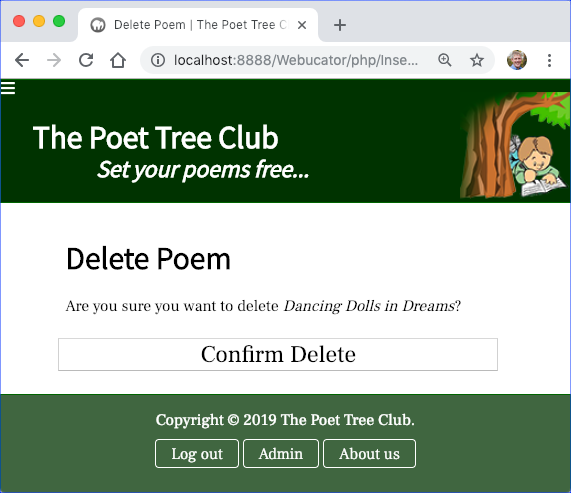 Creating a page to delete a poem. This lesson has no final quiz. To insert, update, and delete records by doing a hands-on lab. In this exercise, you will write a PHP page from scratch for submitting a new poem. Open a new document and save it as poem-submit.php in the InsertUpdateDelete/Exercises/phppoetry.com folder. You will need to bind the parameters to values submitted through the form. $dateApproved should be set to 'null'. In the future, you might want to change this so that when an administrator submits a new poem it is approved immediately. 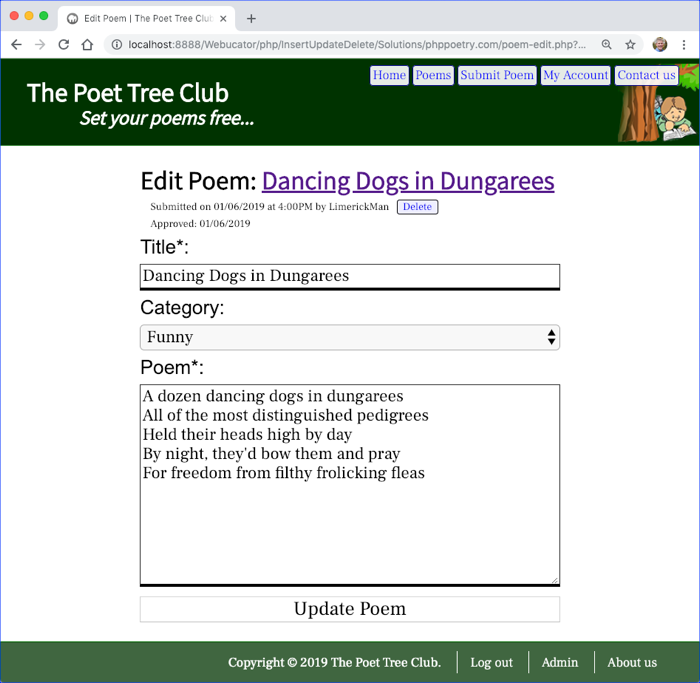 Administrators will be able to approve new poems through an admin interface to be built later. Be sure to write code to catch and log potential exceptions. Open login.php in your editor. After the if (isset($_GET['just-registered'])) check, add an elseif block that checks if no-access exists in the $_GET array. If it does, output the POEM_ACCESS_DENIED constant just as we did with the POEM_REGISTRATION_SUCCESS constant in the if block. Open poem.php in your editor. Modify it so that it outputs "Pending Approval" instead of "Date Approved:" if the poem has not yet been approved. 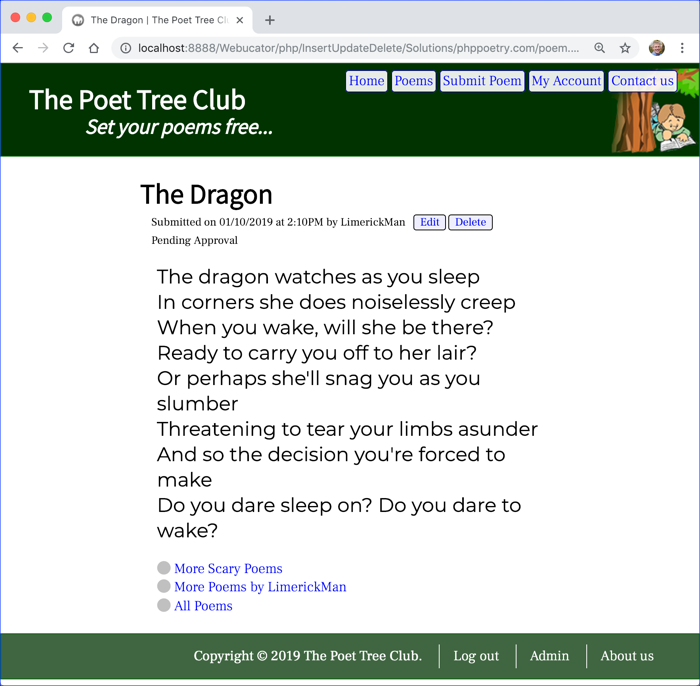 Test your solution in a browser by navigating to Visit http://localhost:8888/Webucator/php/InsertUpdateDelete/Exercises/phppoetry.com/poem-submit.php and writing and submitting a new poem. $selected = $categoryId === $f['category'] ? 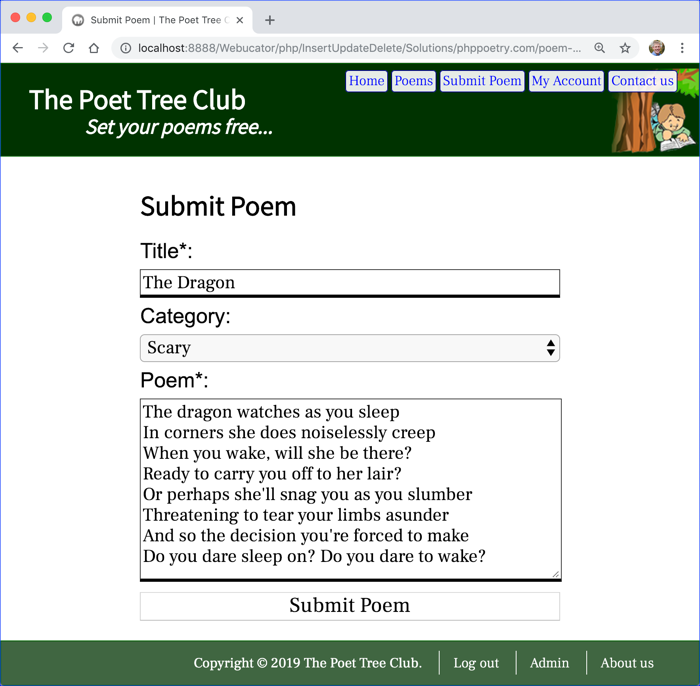 In this exercise, you will modify poems.php so that users can see all their own poems, even the ones that have not yet been approved, in the poems table. Within the while loop within the tbody, use the ternary operator to define a $cls variable. The value should be 'normal' if the $row['date_approved'] is not null (remember that null is falsy). Otherwise, the value should be 'pending-approval'. Currently, $published is getting a date based on the value of $row['date_approved']. But if $row['date_approved'] is null, then $published should get "N/A", for not applicable. Finally, change the open <tr> tag to use the $cls class. Open a new document and save it as poem-edit.php in the InsertUpdateDelete/Exercises/phppoetry.com folder. The author should be able to update the title, category, and text of the poem. When the poem is updated, the date_approved field in the poems table should be set to null. When the user presses the Update Poem button, the page should submit to itself. 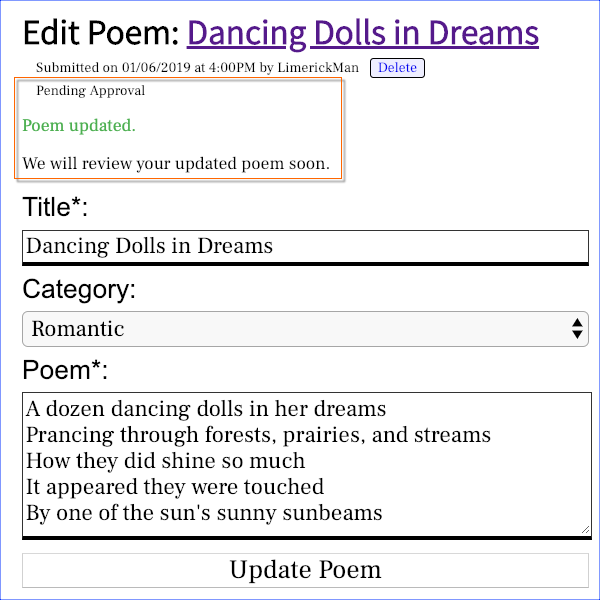 The changes should take effect and there should be a message letting the user know the poem has been updated and will be reviewed: The user could make additional updates and resubmit. Note that only the author of the poem should be able to reach this page. Any other user should be immediately redirected to the home page. If poem-id is not passed in on the URL then the user should be immediately redirected to the home page. 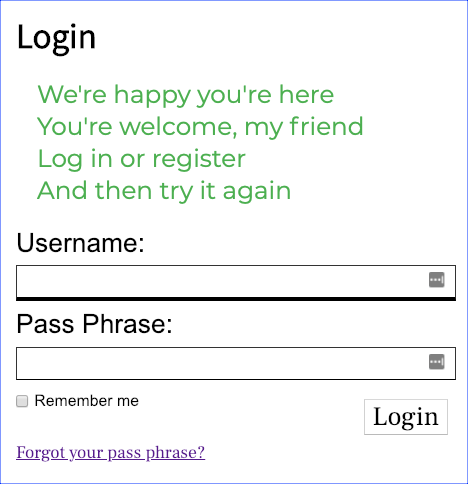 Modify poem.php so that the Edit and Delete links show up only when the logged-in user is the author of the poem. Use isPoemAuthor($poemId) to check this. You will also need to modify those links to point to poem-edit.php and poem-delete.php, respectively, and to pass in the poem id. Test your solution in a browser by navigating to http://localhost:8888/Webucator/php/InsertUpdateDelete/Exercises/phppoetry.com/poems.php, clicking on a poem you wrote, clicking the Edit button, making changes, and submitting the form. 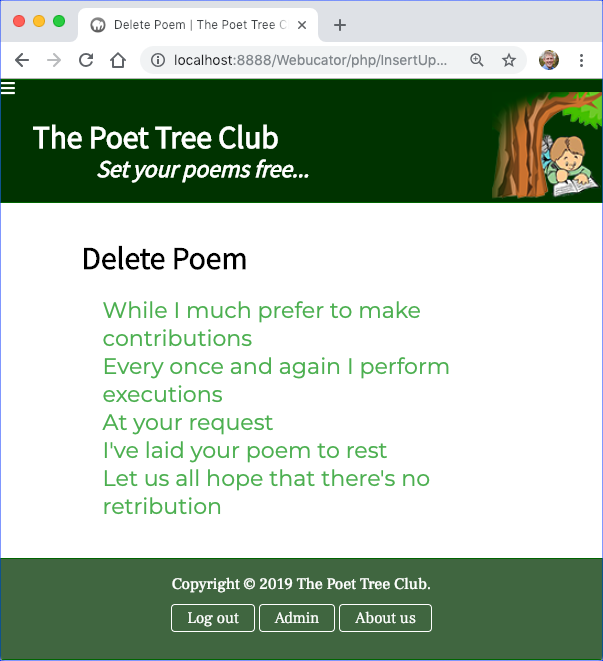 In this exercise, you will write a PHP page from scratch for deleting an existing poem. Open a new document and save it as poem-delete.php in the InsertUpdateDelete/Exercises/phppoetry.com folder. When the Confirm Delete button is clicked, the poem should get deleted and a success message should appear: You can use the POEM_DELETE_SUCCESS constant for the success message. Note that only the author of the poem should be able to reach this page. Any other user should get an access denied. Test your solution in a browser by navigating to http://localhost:8888/Webucator/php/InsertUpdateDelete/Exercises/phppoetry.com/poems.php, clicking on a poem you wrote, clicking the Delete button and then the Confirm Delete button. Does the poem get deleted?